I read this article and found it very interesting, thought it might be something for you. The article is called Bihar’s Swinging Vote: The BJP’s Advantage and is located at https://archive.indiaspend.com/cover-story/bihars-swinging-vote-the-bjps-advantage-99280. With the third phase of polling in Bihar scheduled for today, assembly constituency trends from the 2014 Lok Sabha elections establish the Bharatiya Janata Party’s (BJP) strong voter base in India’s third-most populous state. While the BJP won 22 of 40 seats in the 2014 Lok Sabha elections, the National Democratic Alliance (NDA), led by the BJP, won 31 seats. Electorally, the year 2014 belonged to the BJP. Although the Aam Aadmi Party (AAP) won the assembly elections in Delhi, IndiaSpend’s analysis of how the national capital voted established how the BJP was the runner-up in every assembly constituency. In the Lok Sabha elections, the BJP was ahead in 122 of Bihar’s 243 assembly segments that form the state’s 40 parliamentary constituencies. Source: Election Commission of India; Note: Constituencies arranged according to difference in vote share. Of the 122 seats, the BJP was able to swing voters from 52 Janata Dal (U) seats in the 2010 assembly. The BJP won 91 seats in the 2010 assembly. Considering the trend from the last election, the JD(U), led by former chief minister Nitish Kumar, has to watch these 52 constituencies. National elections and state elections differ in issues, and electorates are mobilised differently. We saw that in the case of Delhi, but in that state, as we explained earlier, the BJP has a loyal voter base. The good news for the BJP in Bihar’s state elections has been an expansion from 55 seats in 2005 to 91 seats in 2010, and, as we said earlier, the lead in 122 assembly segments in last year’s parliamentary elections. The constituency to keenly watch for JD (U) would be Barbhiga in south Bihar, where the party lost the largest vote share. Strangely, neither the BJP nor JD (U) is contesting the seat this time, leaving it to Congress and NCP candidates, among larger parties. Kurhani, Valmiki Nagar and many other constituencies saw the incumbent JD(U) losing a huge chunk of vote shares to BJP in the 2014 Lok Sabha elections. Of RJD’s 22 seats from the 2010 assembly, the BJP won 11 in the 2014 parliamentary elections. The BJP managed to win half their seats, although the RJD was not in power in Bihar at that time. The BJP saw a surge in votes in the 2010 assembly elections in Bihar. The party won 91 of 102 seats it contested that year, and it got a vote share of 40%. IndiaSpend had earlier reported how the BJP factor and the voting system will affect election results. In contrast to the BJP’s rising voter base, the JD(U)’s vote share has witnessed large movements. The constant tussles between the two main state parties – RJD and JD(U) – saw BJP gain to some extent in 2010. IndiaSpend has tracked how the 2014 mandate for BJP got translated to BJP victories in all the state elections that followed. While the votes of Lalu Prasad Yadav’s Rashtriya Janata Dal (RJD) have not swung very much in the last Lok Sabha polls, the BJP has been able to swing the JD (U)’s voters. 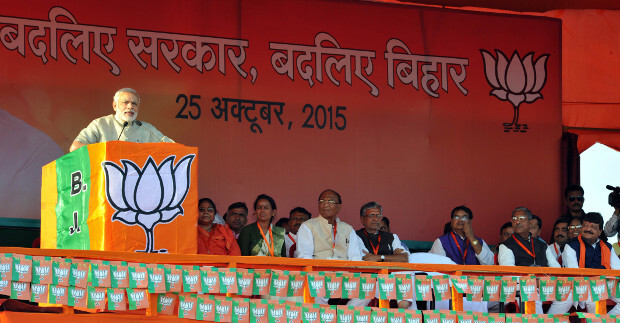 Bihar’s anti-incumbency undercurrents were clear in 2014 BJP’s performance. The question now is: How will the grand alliance of JD(U), RJD and INC, the Mahagatbandhan, overcome the BJP’s winning streak?